When we have guests sleeping over, folding guest beds come in handy and offer a comfortable place to sleep. Folding guest beds are a good choice when you need to save space. The bed is designed with a folding frame and mattress such that you can fold it together with the mattress and store it away. The beds help a lot when you have guests or family members visiting from time to time. When you buy a folding guest bed, you don’t have to permanently dedicate a space in your room to visitors that might come twice a year. 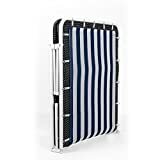 Here is the list of the best folding guest beds in the market to give your visitors a comfortable sleeping place. 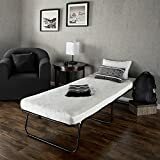 Zinus Memory Foam Resort Folding Guest Bed with Wheels, Narrow Twin, 30" x 75"
The Zinus Sleep Master gives you a comfortable place for the visitors to sleep with 0.5-inch fiber padding and a comfortable 2.5 inches pressure relieving foam. The metal folding frame is a mere 14 inches allowing for easy storage and transportation. The bed folds in half allow for convenience in transport and storage. The Premier Zinus is a twin folding bed for guests and a top quality choice when you have little space to dedicate to guests permanently. 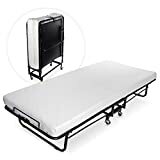 This is a twin size folding bed with a durable grid frame design and a 4-inch foam mattress. It has a storage bag and folds into half to fit the bag. There is a 14-inch space under the frame to offer you additional storage space. iBED is a comfortable folding bed that comes with a foam mattress and a storage bag. The package arrives fully assembled and ready for use. You can relax on the 2-inch foam mattress with comfort. The bed features a spring supported mesh that will nicely contour to anybody. This is a space-saving design that you would love to have in your house. The Zinus Resort with a 5-inch foam mattress is probably the most comfortable folding guest bed to buy this year. Uttermost comfort is ensured through the four inches of high-density foam and 1-inch if memory foam. The frame and mattress are made with matching colors to look stunningly cool in your room. 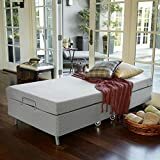 This is a highly recommended guest bed made of the best foam on the market. Zinus takes the guest bed serious and now brings you a folding bed with wheels to allow for easy mobility within the house. This is a bed designed to be highly mobile and can be moved from one room to another with ease. 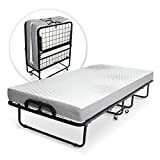 It features a 4-inch mattress and a solid steel frame that is foldable. The frame and mattress have also been made with a matching fabric to enhance its looks. The Milliard can easily be folded and wheeled away making it one of the most convenient guests folding beds on the market. It also features exception fit and finishes where metal frames fold and are double reinforced by the stabilizer bars. 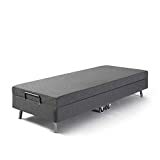 There is a high-quality memory foam mattress and a soft removable cover to add to the comfort. A supple but very supportive trampoline bade further makes the bed a quality pick. Assembly is also simple with very minimal tools required. Minimal assembly required. Just assemble the wheels, and you’re good to go. Featuring a 4-inch foam mattress, the Zinus Weekender will ensure you sleep comfortably throughout the night. At the top of the mattress is a 1-inch layer of fiber padding followed by three inches of pressure relieving foam. The steel frame used is deluxe to allow for easy transport with casters uniquely positioned on the frame. These prevent the legs from moving around when the bed is in use. This Milliard has exceptional stability features and support with a full metal folding frame and four durable legs. There is a further locking brace for safety and a unique lattice wire at the base to prevent the bed from any sagging. The mattress used is the luxurious 2.5 high density with a rating for soft contouring. It is pretty easy to use with a clamshell folding pattern. 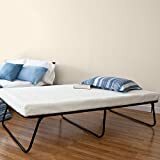 The Lane Foldaway Guest Bed uses three tubular frames to offer stability when the bed is in use. All the three frames easily fold into a small and compact bed that is ideal for transport and storage. There is a top stretch knit cover that is removable and washable. A perimeter spring suspension makes the bed quite comfortable. The Linon is our top folding guest bed with several reviews online and a unique design. It is durably constructed using a steel frame and a high-density foam mattress. The fabric cover is the elegant beige damask. Tubular frames have been reinforced with wooden slats for stability and more support. The mattress is topped with further memory foam for added comfort. 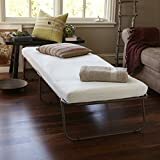 Don’t let your visitors sleep on the couch when you can get one of these folding guest beds at good prices right here. Choose one today and treat your visitor to a great night to remember without dedicating part of your space in the home to a permanent bed.